With hundreds of new startups and plenty of old favorites to catch your attention in Manhattan, it’s easy to get ad-blindness and lost in the choices, leaving you with a bad coffee shop experience or simply none at all. If you’re new to town or looking for something different than your normal hang-outs, you can be hard pressed to find a good cup of coffee and somewhere to unwind. Here are four of the best places in Manhattan to get a cup of coffee as well as a unique experience you can take home. 1. Caffé Bene Whether you’re visiting Manhattan or are a native, it’s difficult to calm down from the bustle of Times Square with a cozy cup of coffee that isn’t Starbucks or home-brewed. If you’re a book lover or simply looking for a tranquil place to relax, then Caffe Bene is the ideal spot. One part bookish and one part culture, stepping into this café is stepping into warm lighting, the scent of pastries, and immediately being met by bookshelves. A lot of them. Caffe Bene’s main theme is its bookish décor with industrial hanging lights over all their tables, making it perfect as a reading nook as well as a quick visit for a cup of coffee. Surrounded by books, you can settle into a large table with your laptop or tablet, or make your mom proud by thumbing through the large collection rather than turning to the internet. Locals recommend their fun menu with selections such as red velvet latte or toffee nut hot chocolate. If you’re looking for something a little stronger, they also offer a range of extremely fruity cocktails. Some complain of the higher-end prices on their waffles and pastries, but the trade-off is worth it for the small crowd and the cozy environment. Plus, waffles. Argument enough. 2. Café Reggio With a history a mile long and a choice of décor that would make the most intense history-lover fan themselves, Café Reggio is a classic, plain and simple. Having opened its doors in 1927, it keeps to the original look and theme of its startup days with old-style equipment and vintage furniture. Right out of the heart of the Italian Renaissance, it’s rumored that Café Reggio was the first to introduce the cappuccino to America; even if it turns out to be just a fun myth, it wouldn’t be hard to believe. One of their most notable features is their old-time espresso machine, created in 1902, shiny and old-style with a worn look and a classic metal angel perched on top. They take on some more modern coffee flavors for all crowds, but boast of their original recipes and brews, as well as their warm and cozy atmosphere. Grab a soup and sandwich, and let quotes from Dante’s Inferno painted across the walls, Italian Renaissance artwork left and right, and wrought-iron fixtures transport you back in time. While some complain of the hot chocolate flavors being sub-par, it counters this with quiet reading nooks and coffee flavors and creation techniques you won’t find anywhere else in Manhattan. 3. Birch Coffee If you’re looking for something quirky, then Birch Coffee is a must-visit place in Manhattan. With exposed brick walls, drywall chipped away to make it look rustic and homey, and tables with rugged-wood looks, this coffee shop is about the human experience rather than a quick cup on the go. Find yourself a quiet table and you’ll be surrounded by bookshelves, all gathered courtesy of the staff and the customers themselves, welcoming you to thumb through them and find your favorite. If you do – you can take it home. It’s not even stealing! Someone has now passed on an experience to you, and you can leave one of your own to pass on the favor. Their food is a bit expensive, especially their sandwiches, but they make up for it with their cold brew and even their hemp milk for the lactose intolerant. If you’re looking to get some work done, there are small areas outside the “library section” beloved for their secluded and private environment. You can try one of their monthly single-brew coffees or try some local food to get the authentic Manhattan experience, and never have the same experience twice with their seasonal selection. 4. 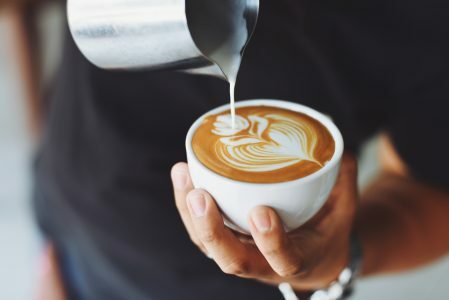 The Chipped Cup Mixing the beloved menu of your favorite café with the easy-going, free flowing décor of a good bar, the Chipped Cup is a place to hang out with your friends or cozy up for good cup of coffee on your break. Located in Harlem, this coffee shop works to add the flare and personality of the area to its interior with exposed brick walls and some creative furniture choices, such as a Singer sewing machine that’s been repurposed as a table. A little quirky, a little bar atmosphere, and a little hipster, all of its decorations are meant to catch the eye and get you Instagraming about it immediately. The locals praise the staff for being friendly and timely, and if you want some fresh air or a cigarette, they have a garden area with tables aplenty for you and your friends – a rarity in Manhattan coffee shops. Unfortunately – but fortunately for you – it’s a little lesser known, meaning you won’t suffer under huge crowds coming noisily in and out. Grab your device, a bagel, and a corner table, and enjoy your privacy. They serve all the favorites from lattes to cappuccinos with some talented staff to draw intricate pictures in your cup. To top off the friendly hole-in-the-wall experience, they offer designer cups with their logo printed across the side, so you can take the Chipped Cup experience anywhere. Despite the sea of choices, a few coffee shops still stand out from the rest. If you’re looking for something quirky and unique, a place to read a good book, or simply a great cup of coffee, these are the four best choices.